This is part two of an eight part trip report from my recent travels to Estonia and Finland. This report covers the KLM Crown Lounge in Amsterdam as well as my Estonian Air CRJ900 flight from Amsterdam (AMS) to Tallinn (TLL) in business class. Upon arriving in Amsterdam we made our way to the Crown Lounge closest to our next departure gate which was B3 within the Schengen Terminal. 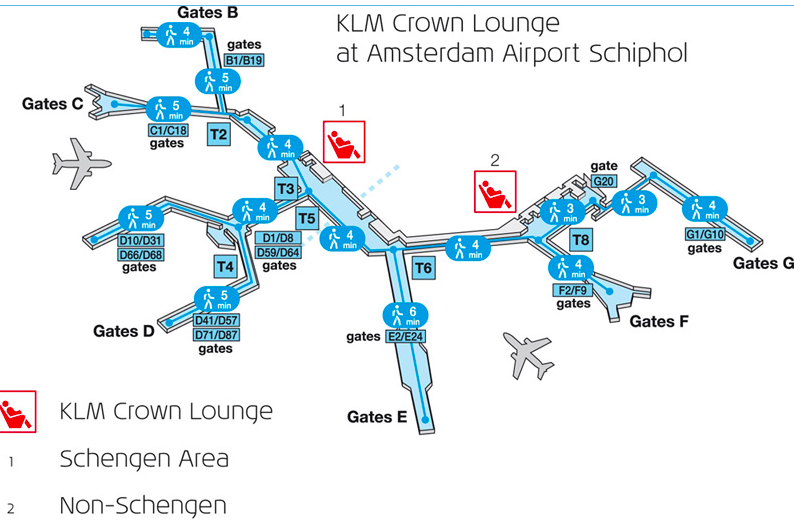 There is another KLM Crown Lounge located in the non-schengen zone. Access for both lounges is restricted to KLM Business Class or Europe Select passengers as well as Flying Blue and SkyTeam / KLM partner Elite members. Of course, elite passengers need to be traveling on a KLM or on an intercontinental SkyTeam flight on that same day. Gold and Platinum Elite members have free access to the lounges and can bring along a guest. Silver Elite members can access the lounges upon payment of a EUR 25 fee but cannot bring along guests. The lounge is quite large and includes a decent amount of leather seats, though during the early morning hours, you may find yourself sitting in one of the media rooms (the circular room in the pictures below) as it’s possible that all the other seats are taken. The food for breakfast included fruits, pastries, assorted yogurts, and cereals. There were no hot options. Even though it was not even 9am, the bar was open with complimentary champagne, red and white wines, and spirits. The Heineken tap did not seem to be turned on yet, though I’ve heard that happens well before lunch as well. Although a few years old, the lounge still seemed pretty modern. The free WiFi was strong, yet there weren’t many outlets in the open public seating areas to charge your device. Make sure you pick a seat near a plug or consider sitting in the media room or near the business center which both had ample outlets. There were also four shower stalls that could be reserved at the check-in desk. We were able to spend extra time in the lounge as each gate had its own designated security area and the lines were much shorter than a central security screening (actually this is only true when flying to a non US location, the dedicated gates for US flights included additional scanning and pre-checks). Estonian Air – AMS-TLL CRJ900 – I was excited for my first ever Estonian Air flight. There’s a 915am (OV 174 / KL 2832) and 815pm (OV 474 / KL 2831) flight which are both KLM codeshares operated by Estonian Air. The flight time is 2 hours and 20 minutes, though our total flight time was just short of 2 hours. I was seated in seat 1F in “business” as it was a continuance of my JFK-AMS business itinerary. I say “business” as my seat was identical to the normal economy seats, except that I had hot breakfast service and the adjoining seat next to me was intentionally not assigned. The service was excellent as I found our flight attendant to be very warm and helpful. The safety briefing was conducted in Estonian and English. When the flight attendant first asked what I wanted to eat, she used her mother tongue. When I responded that I speak English, she immediately switched over and spoke perfectly. Upon the conclusion of the meal service, all passengers are presented with a candy as the flight attendant clears your tray table. One thing I found interesting was an advertisement in the in-flight magazine for Estonian’s empty seat reservation program. You can essentially pay a small fee to sign-up (EUR 1) and another small fee (from EUR 4 to ??) to reserve the chance of buying an empty seat next to you. If the seat doesn’t end up being empty, you receive a full refund within five business days. The flight was uneventful, smooth, and professional. The pilot came on to greet us upon boarding, gave flight path and estimated landing time updates in-flight, and provided weather updates upon landing. All in all, it was a nice no frills flight. No in-flight entertainment or extravagance, but easy, on-time, and clean. I flew Estonian back from TLL-AMS and experienced the same great service. Up next, Swissotel Tallinn & Tour of Tallin. Thanks to gabrielchew on Airliners and Thomas Aleksander Vol for providing additional OV pics! !